One of the great benefits of being a PGA Tour professional is the ability to have companies make you equipment specific to your wants and needs. That is what happened with the latest creation, the Callaway X Hot Phrankenwood. The brainchild of Phil Mickelson, the X Hot Phrankenwood is essentially a modern 2-wood. Mickelson first put an X Hot fairway wood into his bag back in February at the Northern Trust Open. Immediately he noticed the distance gains from the X Hot's Speed Frame Cup, high-strength steel and ultra thin-cast steel body. But you don't get the nickname "Phil The Thrill" from hitting a lot of fairways. In fact, Mickelson's driving accuracy rank the last 5 years look more like professional darts scores (173, 177, 188, 179 and 181) than the rank of one of the best players professional golfers in the world. Having seen the performance of the X Hot fairway wood, Mickelson went to Callaway seeking a similar club he could hit off the tee with more distance, a flatter ball flight and greater control on his draw shots. The solution? The Callaway X Hot Phrankenwood: an 8.5 degree, 250cc, 45" long fairway wood built for low-spin, increased distance and greater control. "You heard me say it's my driver, right? I mean, I don't know if I'm getting this clear. It's a driver, but it just looks like a 3-wood, because our drivers are so big now. But this one is smaller, because it's an enhanced 3-wood." Mickelson said. Mickelson put the new Phrankenwood into play at the Masters for the first time and was able to find the fairway 40 out of 56 times, ranking inside the top-10 for the week (hitting 8 more fairways than eventual-winner Adam Scott). A marked improvement on his accuracy in recent months and years. 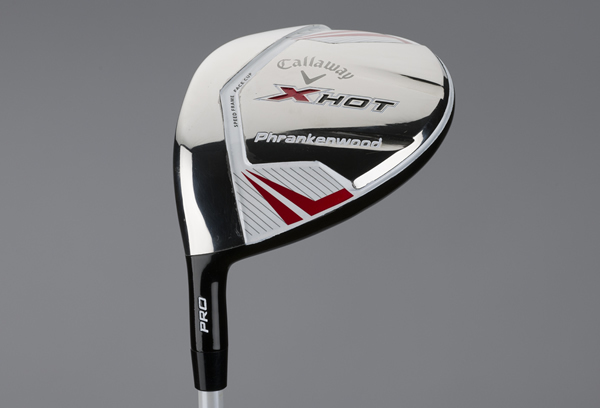 The Callaway X Hot Phrankenwood is not available to the public, although Callaway have produced an X Hot 3Deep Fairway Wood available from April 19th, 2013.